Visitors wander near Hatfield-McCoy feud museum in Williamson. 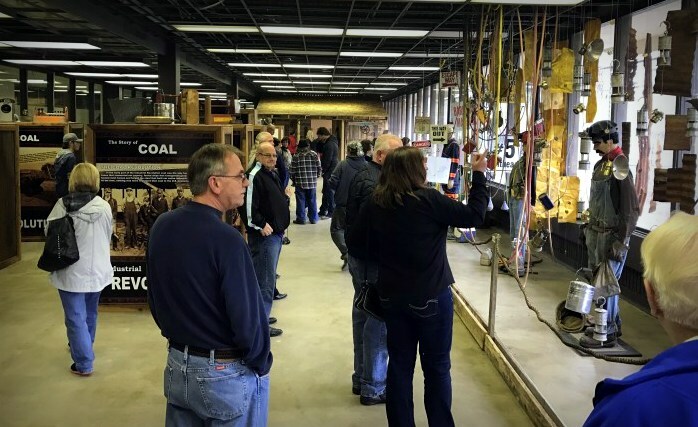 The new Hatfield-McCoy Country Museum at Williamson, West Virginia, on the Kentucky border, features the world’s largest collection of artifacts of the world-famous Appalachian feud, a resource bound to help draw more visitors to the region. A stream of news outlets began touring the site as soon as its doors opened, according to Professor Bill Richardson, who says interest in the feud is far larger than West Virginia residents may be aware. “People are not always aware of the value of their own histories. We’ve had groups from Hawaii to China touring the region over the past year,” said Richardson, who organized the museum and has become a nationally recognized spokesperson for feud-lore. The feud between the Hatfield and the McCoy families erupted in the early 1860s and became analogous with any bitterly feuding rival parties, though several other feuds were waged in the mountainous regions during the period. Richardson says he believes the combination of historic resources, recreational trails, and dramatic mountain beauty could soften the economic decline brought about by the abatement of coal mining in the region. For more than a century the “Billion Dollar Coalfield” was dependent almost entirely on the coal, though in the past five years coal production in Appalachia has been eclipsed by natural gas as a fuel source, and the region faces a bleak economic outlook. Many artifacts in the museum have been featured on American Pickers, the History Channel and Antiques Roadshow, including items from the feud as well as the Mine Wars and the Matewan Massacre, fought nearby. At 801 Alderson Street, museum hours are Tuesday through Saturday from 9 a.m.-5 p.m. For more information, visit the museum website. Did the first teddy bear come from West Virginia? Moonrise walk hints at increased physical activity in southern W.Va.